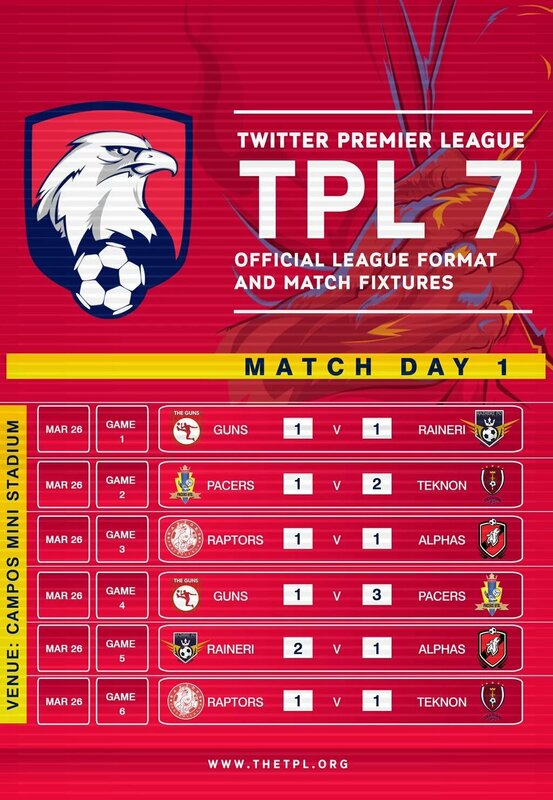 TPL 7 ushered in the new full league format featuring match days before the D-day, in which teams get to play one another in a league system with the top four teams making up the semi-finals on D-day. 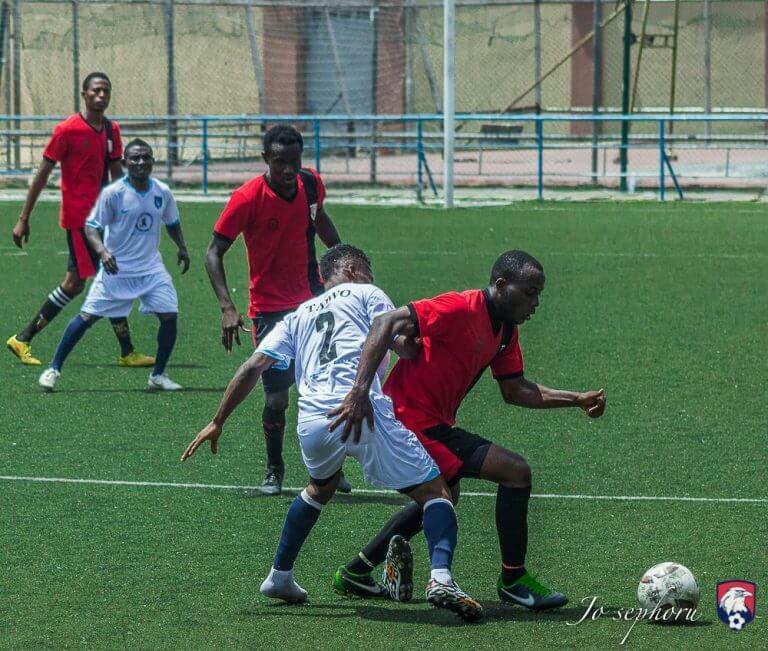 Match day 1 featured six (6) action-packed games, fully-laden with entertainment only the TPL can offer. Match day 1 kicked off with Raineri FC, sporting their purple strip, locking horns with last season’s finalists, The Guns, in their black and green strip, who started the game in brilliant fashion, picking up from where they left off last season, dishing out brilliant ball controls and enviable technique. Wave after wave of The Guns attack were repelled by a resilient Raineri defence whose goalkeeper produced a man of the match performance with save after save. Comedy wasn’t left out of the showpiece as the Raineri goalkeeper, in a bid to get more flight on a throw of the ball, mistakenly stepped outside the box with ball in hand. A yellow card followed, the first of the game, and from the resulting free kick the Raineri goalkeeper produced an outstanding save. Just as half time beckoned, The Guns capitalised on a defensive mix-up, with the calm Ebonie slotting home into an empty net for the first goal of TPL7. The second half resumed with higher energy levels than the first with The Guns dictating play, combining intelligent technique with intricate one-two passes, while Raineri continued with the mass attack and mass defence that had characterised much of their opening half, while The Guns were kept at bay by the impressive Raineri goalkeeper who made a Matchday-record six (6) saves. As the clock wound down, Raineri turned on the heat and were rewarded for all their hard work with a penalty 4mins from time, calmly dispatched by Markfish. The scores were levelled and the final few minutes featured end-to-end end stuff from both teams, clearly searching for the winner, which was not to be. One-all the game ended, with one yellow card apiece shown to both teams. A fair result for both teams. Game 2 featured Teknon versus Pacers and was slightly delayed as the defending champions took their time getting ready, having arrived a little late due to some unavoidable hitches. The game eventually started with Teknon in their white and black strip, while the Pacers were in an all-yellow kit, totally different from last season’s all-blue, with some of the known faces absent, especially their standout goalkeeper known for his shot-stopping abilities and quick reflexes. The Teknon captain, Goodness started the game in impressive style, setting the tone for the game as early as the 3rd minute, as he turned one defender before firing past the helpless stand-in Pacers goalkeeper. The entire atmosphere was one of jubilation as it seemed the goal was welcomed by all especially against the team that wowed and dazzled to the trophy last season. Pacers tried to assert their style of play on the game but were left stunned 5mins later as that guy Goodness popped up again with his second of the game, and then spurned the opportunity to complete his hat trick moments later. This was going entirely against the script. As the game wore on, Pacers took charge of the game and created chance upon chance but their profligacy in front of goal ensured that the half ended with just the two quick-fire goals from the Teknon captain. The second half saw the Pacers race out of the block and one could sense that one goal from them would change the complexion of the game, but that goal proved elusive. However, they left it a little too late as they won and converted a penalty kick in the 32nd minute but for all their artistic play, they couldn’t get the equaliser, ensuring the defence of their title did not get off to a good start. The final game of the first round of match day 1 games saw the Alphas turn on the heat from the blast of the whistle, showing they meant business and unsurprisingly got the first goal of the game in the 2nd minute. That goal though did not have the desired effect as opportunities were few and far between at both ends. The Raptors though offered a much improved performance compared to their showing last time out but poor decision-making meant they headed into the break trailing by a lone goal. The second half of the game started with more promise as the Alphas goalkeeper was forced into making a couple of saves in quick succession while the Alphas searched unsuccessfully for the goal to put the game beyond reach. Quick substitutions were made by both sides, seemingly to alter the course of the game. Just when it seemed the Alphas would see out the game with their lead intact, Raptors got a goal against the run of play, Collins scoring in the 39th minute, handing his team a last-minute equaliser. Both teams had to settle for a share of the spoils in a game that was not really lacking in goal-scoring opportunities. The first game of the second round of games turned out to be a replay of TPL6 finals which the Pacers won after penalty shoot-outs. The Guns needed to win to move up the table while the Pacers needed to win to have a chance to successfully defend their title. The match promised to be entertaining and didn’t disappoint. Pacers came firing on all cylinders, scoring the fastest goal of the season in the 1st minute of the game, Ezekiel firing the champions deservedly ahead after a quick interchange of play, showing the form that made them champions. That lead was doubled in the 8th minute when Afolabi finished off a fine team move. At this point it had ceased to be a contest and was only a question of how many more goals Pacers would score, but spurned chance after chance to add to their tally before half time. The second half resumed much the same way as the first, Pacers dictating play but finding it increasingly difficult to increase the tally. 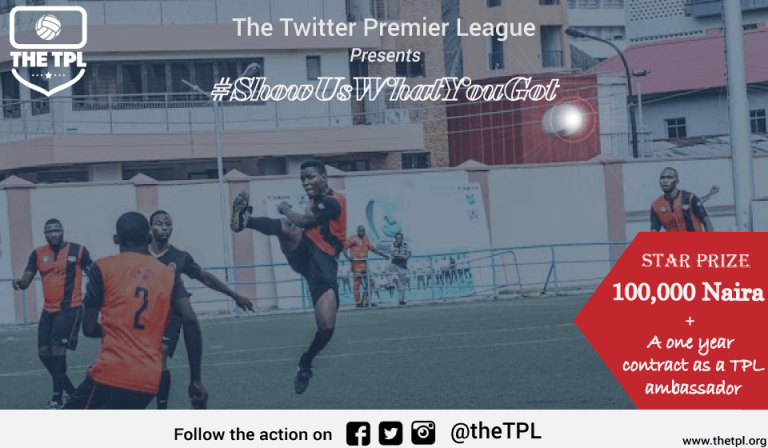 The Guns showed a glimpse of their ability, but couldn’t yet find a way past the Pacers goalkeeper, the stand-out performer from TPL6, forcing a couple of inspired saves from the goalie. It seemed as though the Guns would not get a goal from anywhere, while Ebonie looked like their only outlet for a goal. The Guns won and converted a penalty in the 38th minute via none other but Ebonie. However, all hopes of a come-back was quashed when Ayo scored a beauty of a freekick just before the final whistle to put the game to rest. 3-1 it ended in favour of the defending champions, another electrifying display of attacking football from them. 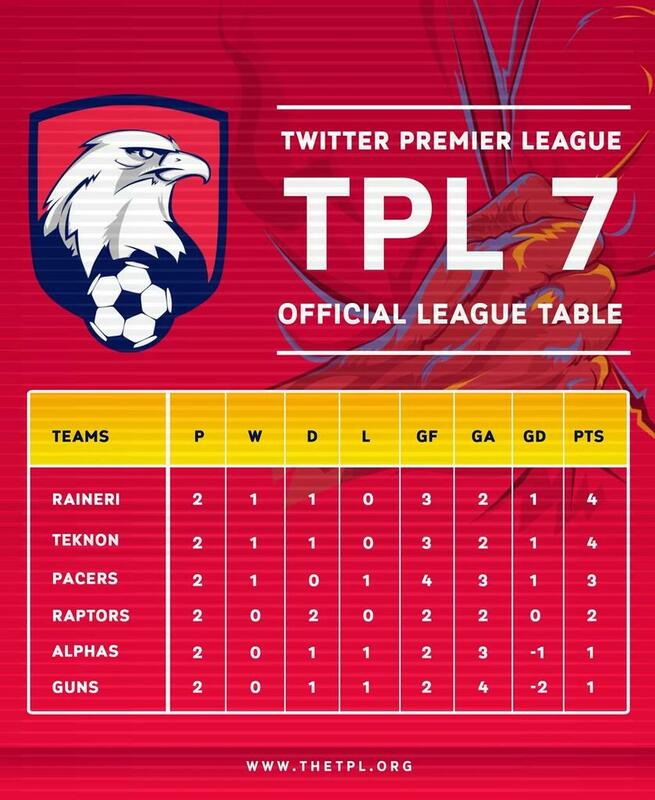 Raineri had revenge on their minds as the 4-0 thumping they suffered at TPL6 was still fresh, while both teams needed a result to consolidate on the results from their opening games. Two goals from Ranieri’s Adelanwa were enough to ensure Ranieri had the last laugh this time out. End-to-end stuff resulted in a breakaway run from the Ranieri No.21 and the ball found its target in the Alphas goalpost in the 12th minute. The impressive Ranieri goalkeeper produced a fantastic save to ensure his team went into the break with the lead. The second half saw another rampaging run by Ranieri, barely 4 minutes into the half, as Adelanwa stretched the lead with his second goal of the day. Bunmi eventually pulled one back for the Alphas in the 33rd minute but brilliant saves from the Raineri goalie ensured that it would be nothing more than a consolation goal for the Alphas. Final game of Matchday 1. Much had been talked about prior to the game, with the Raptors officials confident of having the bragging rights come the end of the day. However Teknon would draw the first blood via a smart finish from Ejanla in the 3rd minute. This game was certainly not one for the purists as both teams threw all they had in order to secure victory. The tackles came flying in as the game threatened to turn ugly. First, a Teknon player had to be taken off the pitch for treatment following a body-check gone bad from an opponent. Another similar tackle got players enraged but fortunately the referee was able to calm things down before half time. Second half resumed without much note-worthy incidents and just when Teknon felt they had won the bragging rights for this one, Raptors scored the equaliser with virtually the last kick of the game via Lami, another last minute salvo for them, their second in as many games. HOW THEY STAND: LEAGUE TABLE AFTER MATCHDAY 1.